Around the Kentucky region, stories of outlaw whiskey fill the hills, and with the surge in popularity being enjoyed by the whiskey industry it’s no surprise that moonshine has become all the rage. 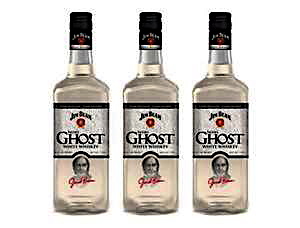 Jim Beam is hopping into this niche market in a big way with the release of its newest spirit, Jacob’s Ghost. With a slick, clean bottle design, and catchy name, this latest offering complements Beam Inc.’s other recent additions of Red Stag and Devil’s Cut. Jacob’s Ghost is a homage to Jacob Beam, the founding distiller of Jim Beam whiskey, and delivers a reminiscent concoction to what might have been crafted back in the 1790s. Unlike true bootleg whiskey, which is bottled straight from the still, this 80-proof ‘shine’ is aged at least one year in charred, white oak barrels, so it gains some flavor from the wood and mellows the bite. These are the same barrels bourbon is aged in, which is where that caramel brown color comes from – it just stays in there considerably longer. After only a year there isn’t much color change to Jacob’s Ghost, but it does take on a slightly yellow hue. The fact that there is a market for legitimate moonshine is something that has been brewing over the last 20 years. The bourbon industry has gone to great lengths to redefine itself as a sophisticated yet vibrant beverage. 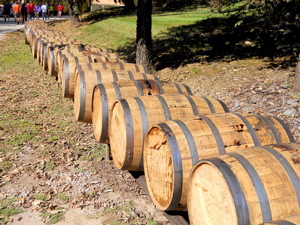 All the brands have become more business savvy and extremely image conscious about attracting visitors, which in large part can be credited to the Kentucky Distillers’ Association, who in 1999 founded the Kentucky Bourbon Trail. This fellowship linked seven competing distilleries together in an overarching goal to raise the profile of bourbon. The idea was to showcase the history of whiskey production in Kentucky and how it has evolved. As a corollary benefit, a tourist destination was cultivated. Travel routes were mapped out between each distillery, guided tours began being offered, and bourbon passports were issued, earning visitors a stamp at each stop, and complimentary t-shirts for those who visited all seven distilleries. This created demand, not just for bourbon, but also for the history behind these bottles. 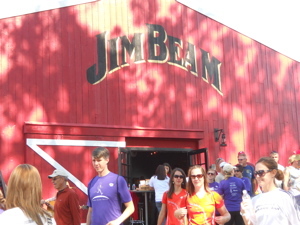 Jim Beam’s welcome center in Clermont, Ky.
Each distillery shares a fascinating tale about how they came into existence, who the founding families were that developed the sour mash recipes, and those that continue to serve as master distillers. The Kentucky Bourbon Trail brought all this together and made people want to seek out bourbon’s heritage. For many it’s during these tours where they are first exposed to white whiskey. For years distilleries have offered samples to visitors of what is known as “white dog,” which is the raw product out of the still before it’s placed into barrels for aging. White dog has a pronounced taste, with the grains used in the distillation quite identifiable in flavor. It’s not for the faint, though the tour guides mention how employees around the distilleries often prefer the white dog to the finished product. This is a story that sticks with people after they have left a distillery, and makes for interesting trivia to share with friends. It also factors in nicely to the continued romanticism that permeates the idea of bootleg whiskey. It’s an ideal stoked in popular culture by television shows like Boardwalk Empire and Justified – so stories about workers preferring white dog and giving out sample shots are quite effective in expanding the appeal of moonshine. The actual sale of white whiskey is a relatively new occurrence and something that is a side aspect to the finished bourbon experience. 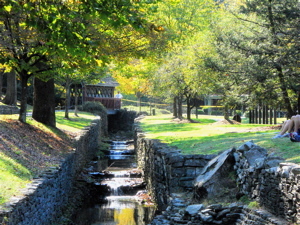 The stream at Maker’s Mark in Loretto, Ky.
Last year sales of white whiskey in the United States exceeded $7.5 million. That’s an increase of more than 300 percent from the previous year, but is a drop in the barrel when compared with the $2.2 billion in sales from Kentucky bourbon and Tennessee whiskey. Still, the white whiskey trend warrants exploration. Bourbon drinkers are a kooky bunch. They take their brands seriously, and there is a certain pioneering appeal to discovering the natural tastes of whiskey before it’s aged. Another factor driving this moonshine trend is the introduction of smaller craft distilleries around Kentucky, like Barrel House in Lexington and Limestone Branch in Lebanon, which are making boutique spirits, including short-aged bourbons and white whiskey. Jacob’s Ghost enters this fray with what Beam feels is a slightly different product. With the extra flavor that comes from a year in the barrel and a more refined finish, the idea is to have Jacob’s Ghost cash in on the revitalized cocktail culture. This is a young whiskey, but drinks easier than expected, and could be substituted in place of other traditional white liquors to give an old cocktail a new taste. 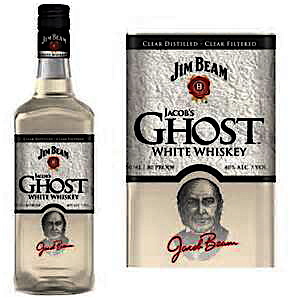 Interestingly, instead of first introducing this new whiskey in airline bottles, so people could try it out, Beam went straight to bottling fifths of Jacob’s Ghost. Supposedly small bottles will be released at a later date. In the meantime for those wanting to sample this apparition from days past, a fifth will run you $21.99. This would be a great Cinderella selection to bring over to a friend’s house for March Madness this weekend. Kentucky may not be in the tournament, but Louisville sure is – and Jacob’s Ghost conjures a unique atmosphere of bygone eras and Bluegrass appeal. As always drink responsibly and Go Cardinals! This entry was posted in Food, Liquor, Reviews, Travel and tagged Beam Inc., Jacob's Ghost, Jim Beam, Kentucky Bourbon Trail, Kentucky Distillers' Association. Bookmark the permalink.